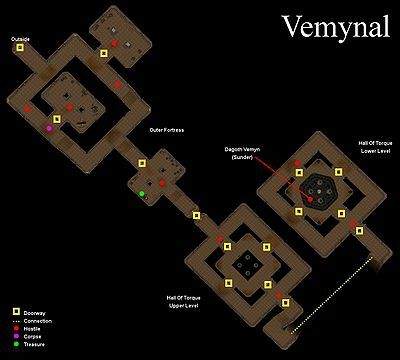 Vemynal is an Ash Vampire Citadel in the Red Mountain region, inside of the Ghostfence. 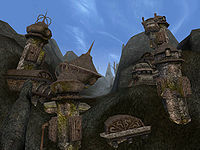 The old Dwemer fort is now named after the residing Ash Vampire Dagoth Vemyn. It is located at the northwestern edge of Red Mountain just past Endusal inside the Ghostfence, and is marked on your world map. This is where you will find Sunder during the Main Quest. Vemynal is divided into two areas, the Outer Fortress and the Hall of Torque. This is the main entryway of Vemynal. There are two Dagoths (Garel and Nilor), and three other enemies (one is a Greater Bonewalker). You can find a number of potions, a grandmaster alembic and calcinator, the books Special Flora of Tamriel and Ruins of Kemel-Ze, some Dwemer equipment, and a few ingredients. Accessed from the Outer Fortress, there are several unique enemies here: Dagoth Vemyn who has the Amulet of Heartheal and Sunder, and Beldoh the Undying who has the Blood Feat Shield. Two more Dagoths (Felmis and Soler) and a Dremora Lord round out the defenses. To the east is a secret entrance to Kogoruhn, which is also the location of a part of the main quest. This page was last modified on 17 July 2018, at 12:13.